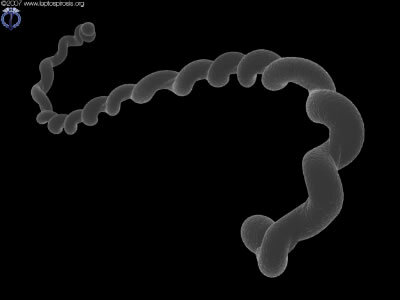 The Leptospirosis Information Center is an independent and impartial repository of information about human leptospirosis and Weil’s disease. We are the oldest website providing free and impartial information about this disease. The site primarily deals with human infection and public health, although there is also some veterinary information for those owning or working with animals. Due to cuts in staff and resources, the LIC website is no longer being actively updated, nor do we provide any email-based advice or information. This site has been operating for over 20 years and is widely-used as a reference, so our ISP has agreed to keep the site online in the medium term, as an archive, but we cannot guarantee that the information on the site will remain a reflection of current practice. All pages are accurate as of Dec 2011 to the best of our knowledge. Please choose a topic from the menu to the left. Leptospirosis, also known as canicola fever, hemorrhagic jaundice, infectious jaundice, mud fever, spirochetal jaundice, swamp fever, swineherd’s disease, caver’s flu or sewerman’s flu, is a bacterial infection resulting from exposure to the Leptospira interrogans bacterium. There is an acute form of human infection known as Weil’s disease, where the patient suffers from jaundice, though this term is often (incorrectly) used to describe any case of infection. Weil’s disease is comparatively rare, though ‘mild’ cases of leptospirosis happen everywhere there are carriers, and it is believed that leptospirosis is one of the most common zoonotic infections in the world. Millions of people are infected each year, but information and treatment can be limited, especially in the developed world where cases are considered ‘rare’ by the medical community and where medicals professionals such as CNA, LPN and other nurses as well as doctors might miss it because they are not looking for the disease. The goal of the LIC website has been to increase awareness of the infection and how to manage the risks, with clear advice and guidance for all aspects of work and leisure. Warning: We have recently received reports of a rumour that Chaga is an effective treatment for Leptospirosis. This is not true. Chaga is being investigated for it potential beneficial effects but there is no evidence that it is effective against any disease. There are no supplement that is known to be able to treat Leptospirosis. Allways see a doctor amd recieve a proper treatment if you get the disease. How quickly can an illness develop? Where can I get information cards to carry?